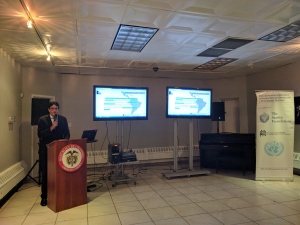 On the evening of Tuesday, April 25, the Auschwitz Institute for Peace and Reconciliation, in its role as Technical Secretariat of the Latin American Network for Genocide and Mass Atrocity Prevention, held a launch event for the 2016 Annual Report of the Technical Secretariat of the Latin American Network at the Consulate General of Colombia in New York City. The event welcomed representatives of several member countries of the Latin American Network, including Colombia, Brazil, Costa Rica, Ecuador, and Uruguay, alongside other actors involved in the prevention of mass atrocities from UN Permanent Missions, civil society, and the private sector. The report, available in both Spanish and English, outlines the actions that took place at the national, regional and international levels towards the prevention of genocide under the banner of the Latin American Network throughout the year of 2016. 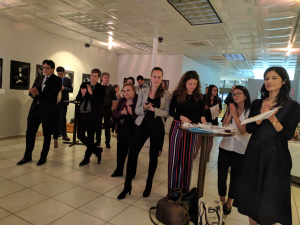 This past year was especially noteworthy, as it included the conclusion of the pilot phase of the Raphael Lemkin Seminar for the Latin American Network. Conceived and implemented for public officials from the participating member states of the Network, the third cycle of the Seminar opened at the site of Auschwitz-Birkenau in Poland and completed in Montevideo, Uruguay. 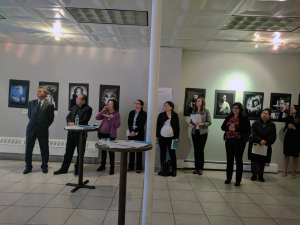 The launch event for the Annual Report included contributions from several representatives and stakeholders involved in the continued success of the Latin American Network. Speaking first, Consul Maria Isabel Nieto, representing the host institution, welcomed attendees to the launch event. She discussed her country’s support for, and continued participation in the Latin American Network. Consul Nieto also took a moment to reiterate the importance of supporting measures of peace and reconciliation, especially in consideration of their relevance to the post-conflict phase of the ongoing peace process in Colombia. Ms. Stephanie Alvarez, Latin American Programs Coordinator for the Auschwitz Institute took the podium next. 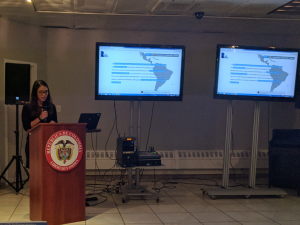 Ms. Alvarez provided a brief overview of the Latin American Network, its composition, and the initiatives that have been produced since its inception in 2012. She then introduced attendees to the configuration of the 2016 Annual Report. Ms. Alvarez was followed by Dr. Tibi Galis, Executive Director of AIPR, who spoke about the success of the Latin American Network and the importance of the regional network to global efforts for atrocity prevention. Dr. Galis highlighted the essential contributions and commitment that the participating countries have made towards the success of the Network and towards a growing global culture of prevention. Mr. Owen Pell, President of AIPR’s Board of Directors, followed Dr. Galis with remarks on the importance of the continued success of the Latin American Network to the proliferation and mainstreaming of atrocity prevention around the world. He also signaled the vital nature of the innovation and consistency with which work on prevention is being done in the region. Ms. Eugenia Carbone followed Mr. Pell and spoke to event attendees about the activities and programming carried out by the member countries of the Network in 2016. 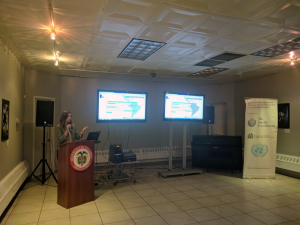 In addition to highlighting the importance of the conclusion of the pilot phase of the Raphael Lemkin Seminar for the Latin American Network, Ms. Carbone discussed the launch of the Network’s virtual meeting space, the continuation of regular Focal Points Meetings, and the proliferation of national-level initiatives on prevention held within member countries. 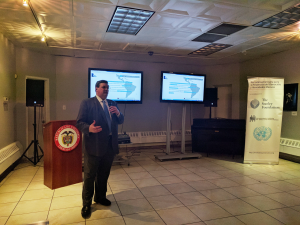 Mr. José Luis Guerra, Director General of Protection at the Ecuadorian Office of the Ombudsman spoke next, emphasizing the strength of the Network that is realized through the diversity of the participating Focal Point institutions of each member country. He discussed the essential contributions that his country’s participation in the Network has made towards the development of its national institutions for human rights. He also underscored the importance of several innovative initiatives that have been developed with the support of the Latin American Network, including a forthcoming space for memory and reconciliation in Quito. Ms. Claudia Diaz, representing the United Nations Office of the Special Advisers for the Prevention of Genocide and the Responsibility to Protect, then took the podium. Ms. Diaz spoke about the growth of the Network over the past five years from the perspective of the Office of the Special Advisers, which has served as a longtime supporter of the initiative. She extolled the value of regional tools like the Network in the continued mainstreaming of an atrocity prevention agenda around the world. Finally, Ms. Jai-Ayla Sutherland, Associate Program Officer at the Stanley Foundation, explained the pride that her organization takes from their involvement in supporting the Latin American Network and the constituent activities for prevention that take place at the national level of participating member countries. On behalf of the Stanley Foundation, she expressed the desire to continue supporting the operation and expansion of the Network, including the development of the regional curriculum for prevention and engagement with key stakeholders, such as legislators. The 2016 Annual Report of the Technical Secretariat of the Latin American Network for Genocide and Mass Atrocity Prevention (http://www.redlatinoamericana.org) is available in Spanish and English. For more information about the Latin American Network and/or AIPR’s programming in Latin America, please contact Diana Mantilla, AIPR’s Latin American Programs Liaison.